The "Red Dot" edition in either silver or salmon. Nomos regularly issues limited edition versions of its simpler watches like the Tangente and Orion, but less frequently of its world time watches. Ordinarily available with a white or metallic blue dial, the Zürich Weltzeit (“world time”) has been tweaked to create two new variants nicknamed “Red Dot”, exclusively for Singapore retailer The Hour Glass. The first Zürich Weltzeit Singapore is limited to 35 watches, and has a white dial with red accents, a nod to the colours on the Singapore flag. Instead of the conventional “Hong Kong”, the time zone of GMT +8 is replaced by “Singapore” in red. A red circle to indicate the home time zone at three o’clock is a reference to “little red dot”, a nickname sometimes used for the city state that’s small enough it’s often depicted as a dot on maps. 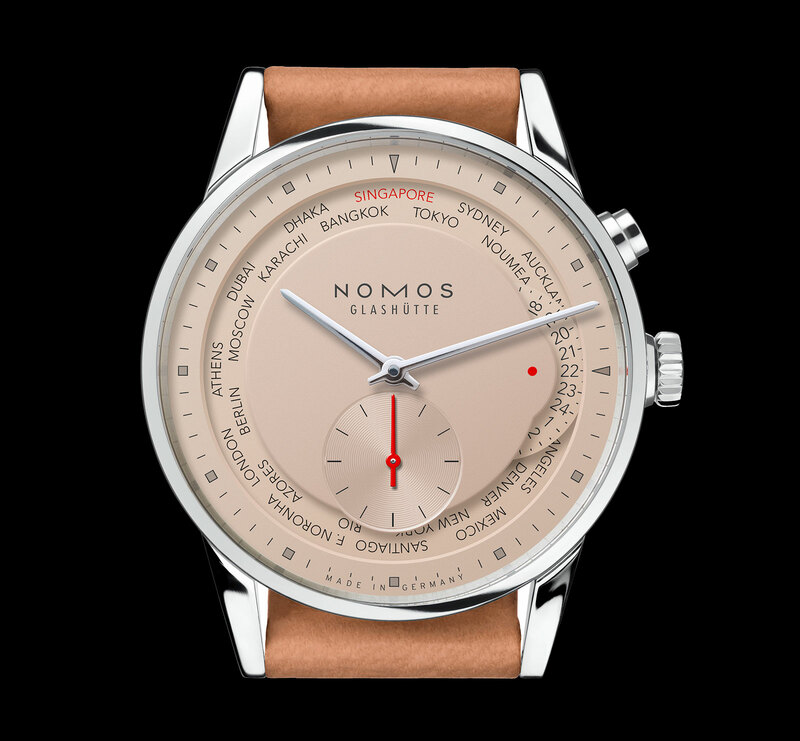 The second Singapore edition has an unusual salmon-tone dial, the second time Nomos is utilising this colour (the first was a small run of watches for a German retailer). It also features “Singapore” on the cities disc, as well as the red dot at three. This is limited to 15 watches. Dial colours aside, the Singapore edition is identical to the regular Zurich Weltzeit. The steel case is 39.9mm in diameter and 10.85mm high, with the button at two o’clock to advance the local time display in one-hour steps. 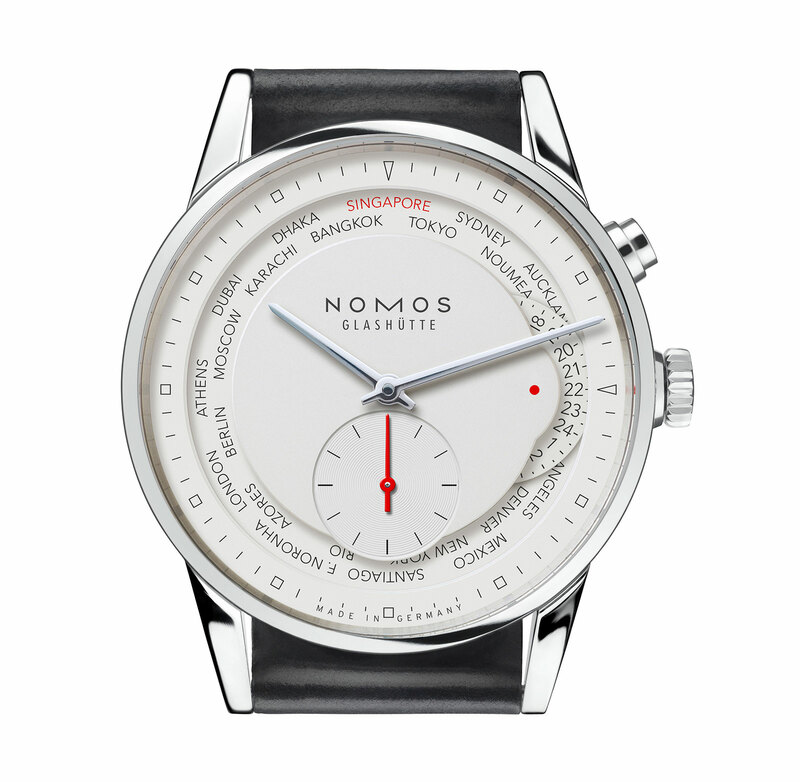 Distinctly different from most other Nomos watches with its angled, pointed lugs, the Zurich was designed by the late Hannes Wettstein, a Swiss industrial designer who named the watch after his hometown. Wettstein, who died in 2008, was a prolific designer best known for furniture and lightning but was also the cofounder of defunct watch brand Ventura. The Zurich Weltzeit is powered by the DUW 5201, an in-house Nomos automatic movement with 42-hour power reserve that’s visible through the display back. 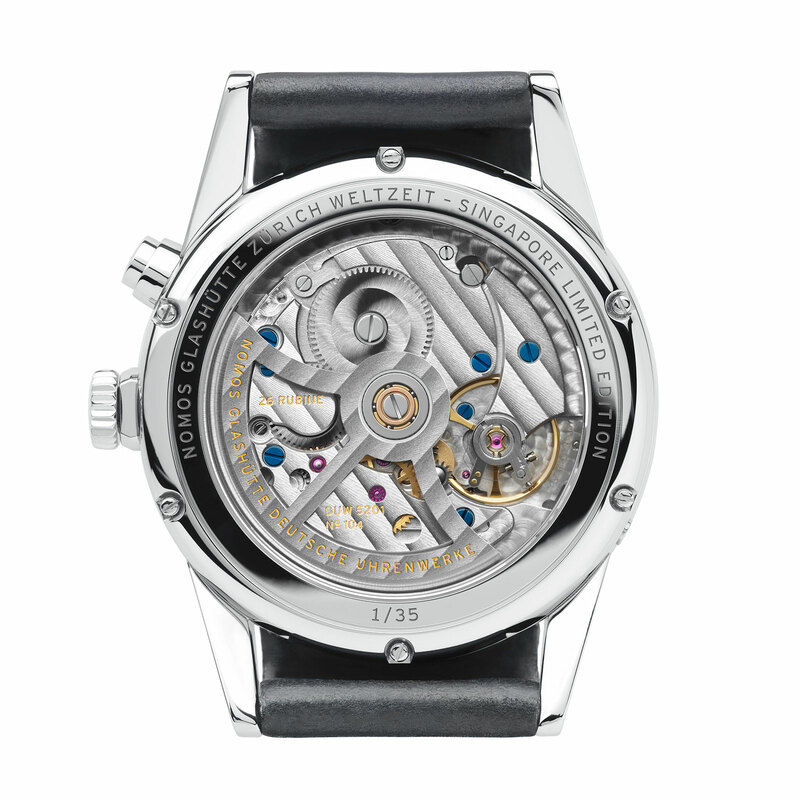 The movement is also equipped with the company’s own escapement and hairspring, explaining the”DUW” prefix, short for Deutsche Uhrenwerke, or “German watch factory”. 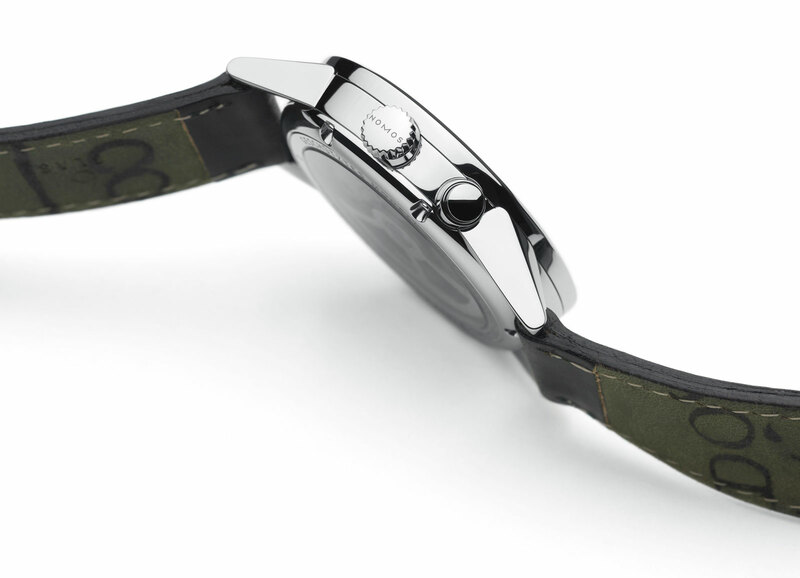 In contrast, Nomos movements without the in-house escapement are named after Greek letters. 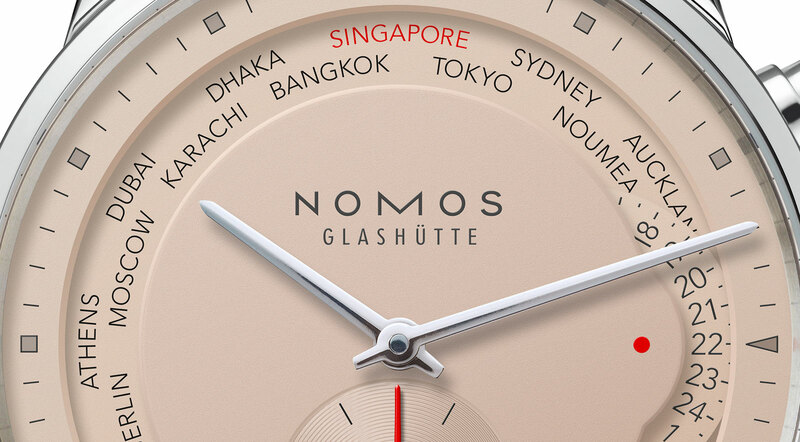 Both the Nomos Zürich Weltzeit Singapore limited edition in white (ref. 805.S6) and salmon (ref. 805.S7) are priced at S$8560, about US$6360. Both will be available starting September 29 either online at The Hour Glass or its subsidiary Watches of Switzerland stores in Singapore.